In addition, Nelson had a cut streak of 113, which is second only to Tiger's 142. But that's not the whole story. Since the PGA defines a made cut as a made check, and only the top 20 finishers made a check in Nelson's time, that gives him a record 113 Top 20 finishes in a row. A side note: I find it ironic that Nelson never won an Open Championship, yet his most famous student -- Tom Watson -- is considered the "King of the Open." 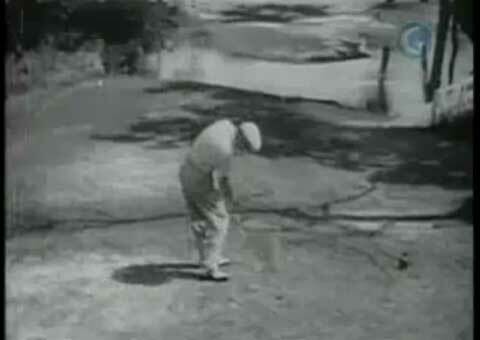 Nelson didn't get to parallel at the top of his backswing, even with the driver. But he was accurate and surprisingly powerful, as you can see by how blurred the club is, even in slo-mo! The distinctive move in Nelson's swing is how much he bends his knees. Notice that his left knee doesn't straighten until the ball is long gone, and his right knee looks as if it's collapsed! By dropping his body this way, Nelson loaded the metal shaft much more forcefully than was possible with a hickory shaft. Coupled with his upright swing, he developed an amazing amount of power with a relatively short swing and used it to trap the ball. That let him hit crisp, accurate approach shots. Essentially, Nelson put the "down" in "hit down on the ball." Look at how he dips his right shoulder at impact! (See the picture below.) That also forces his hands more down than out. Although you won't see it taught to the degree that Nelson does it, he changed the golf swing when he started using that knee flex. "Hitting down on the ball" is now a basic tenet of every golf swing... and you can thank Lord Byron for that.